Travel to one of the most preserved and pristine places on earth- Bhutan. Discover exceptional hiking through untouched natural landscapes and culturally flourished valleys across stunning scenery. Enjoy hoards of unique travel experiences and acquire life long memories as you get to know the life of locals driven by its unique happiness philosophy. This 7 Day/6 Night short break includes accommodation in three star hotels and one night in a farm house stay. 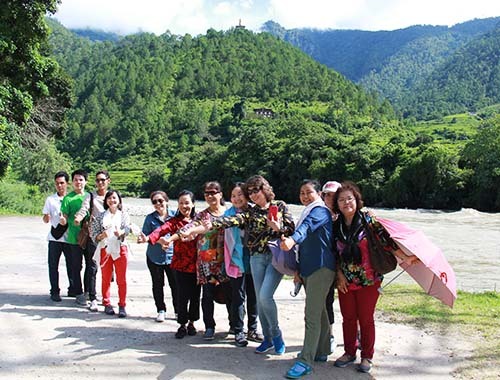 Activities include sightseeing walking tour of Paro, guided hiking around Thimphu, Punakha and Wangdue, farm house stay in Lobesa, guided hike to Tiger’s Nest, hot stone bath experience and more. Bestowed with all the goodness of Mother Nature, Bhutan is a dream destination for nature lovers. Its deep valleys, silent wilderness and historical monuments provide an exclusive blend of nature to explore and a unique cultural and traditional experience. 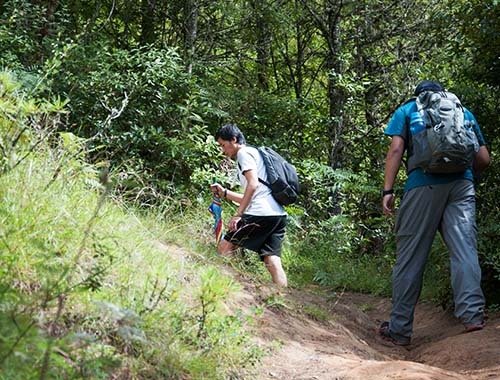 With 81% of landmass under forest cover, some of the well-known hiking trails pass through protected national parks with diverse flora and fauna. 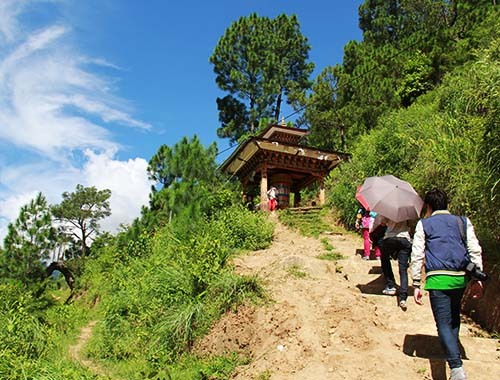 Some hiking trails on off the beaten paths provide opportunities to visit magnificent temples and monasteries perched on hilltops, offering panoramic views of lush greenery and exciting photographic opportunities. In the western districts of Paro, Thimphu, Punakha and Wangdue the hiking trails are well maintained and offer rich glimpses of diverse flora and fauna. Paro Valley is famed for its broad landscape and rich cultural history. The hike across Chelela pass to the Kila Nunnery Centre and to the popular Tiger’s Nest offers adrenalin pumping adventure and opportunity to experience nature in its purest form. The experience and memories you will carry back home will be etched forever in your heart. Pair of full sleeve shirts and pants for cultural visit. Pick-up from the airport by your local guide and drive straight to the hotel for arrival refreshment and room check-in. Following lunch at the hotel, venture a walk towards Nimezampa through small township of Paro. Crossing the traditional bridge stretching over Pachu River, enjoy a five-minute gentle climb until you reach the majestic Ringpung Dzong. At the dzong, you will be escorted to the main courtyard, the venue of the Spring Paro Festival and the Inner Sanctum revealing the Drukpa Kadygu tradition, Buddhism and 17th century political history of Bhutan. Enjoy a walk around the main courtyard taking pictures and interacting with the young monks. From Ringpung Dzong, take a short hike to the National Museum, which used to be a watchtower located above the fort. This five storied round building displays a rich collection of arts and artefacts, traditional armaments, Thangkas of spiritual matters, textiles, endangered animal parts and traditional household tools from across the country. Upon completion, take a breathtaking hike across Shari through rice fields and rural communities that offers ample opportunities to see the rural way of life. Finishing the hike, drive to Kichu and Drugyal localities to visit the ancient Kichu Temple and Drugyal Fort ruins. In the evening, explore the main town of Paro, soaking up the sights and scenes of the local people. After breakfast, take a driving excursion through thick pine forest all the way up to Chelela Pass, perched at 3989m offering a panoramic view of Haa and Paro Valleys including Mt. Jhomolhari, 7315m. The pass is a winter home to the nomadic herders, where during the winter and early spring you can see the yak herds. 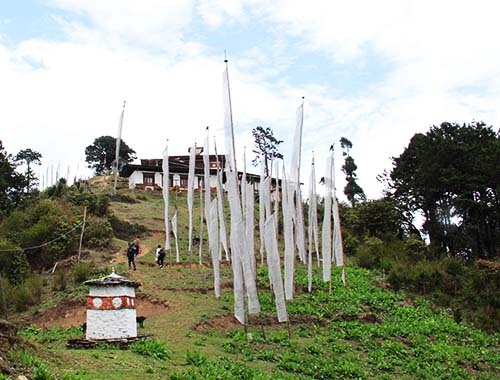 From the pass, take a short climb up to a small stupa surrounded by prayer flags. Make a gradual descent followed by a walk through the undulating trail leading to the Kila Nunnery Centre across the mixed forest and ridges. Enjoy the hike, which also combines the rare chance to view mountain birds. Kila Nunnery Centre is a home to approximately 40 nuns secluded on the folds of towering rocky hill within the serene ambience to pursue meditation and spiritual learning. You will get to know several legacies of the past meditation practitioners and spiritual leaders. Spend some time talking to the holy nuns who have deserted to journey through layman’s path in search of eternity. 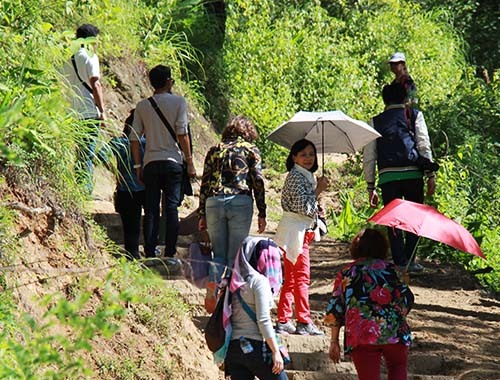 After a while, descend downhill following the rugged trail passing through pine forest until you cross the mountain stream. After a short climb from the stream, you will reach you the point in the road where your driver will pick you up and drive you to a scenic spot for picnic lunch. Drive straight to the capital city, Thimphu after the lunch and retire for a short break in the hotel to reenergize for a breathtaking walk up to Buddha point. Or take an optional bike ride. Phajoding, literally translating to “tranquil gorge”, is a historic residence of the Tibetan yogi Tongden Phajo who spent meditating in 13th century. The present stature of monastery which houses ten temples amidst sparse settlement was built in 17th century, initiated by the 13th Abbot, Shkya Rinchen. And his image remains enshrined as the main content inside the main temple still today. With its historic significance in the Drukpa Kadygu Tradition, Phajoding Monastery is enlisted as a UNESCO World Heritage Site, which is yet to be recognized. The monastery offers a place of worship to thousands of Buddhist devotees and a sacred centre of Buddhism learning to young monks. The monastery is located approximately seven kilometres northwest from the capital city, hidden in a dense forest. The place offers panoramic views of Thimphu Valley and the surrounding mountains. 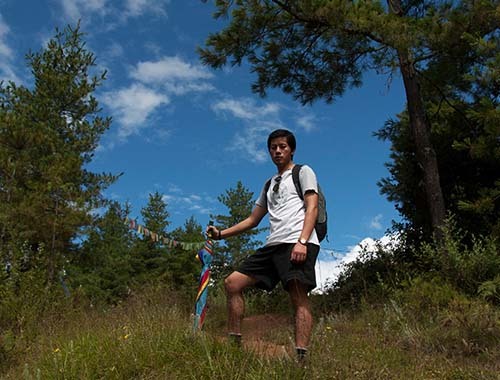 The hike will commence from Sangaygang BBS tower with a climb over hills covered by prayer flags through pine forest all the way up to Chhoekhor Tse Temple. After a brief rest, resume a walk through straight trail until you encounter bifurcation point. Take the left trail that will make a gentle ascent through the forest. Continue trekking until you come across a stupa offering a view of Phajoding Monastery on the hilltop. Another 45 minutes of gentle climbing from the stupa will take you to a monastery offering stunning views of Thimphu Valley and green mountains. Activities at Phajoding include a visit to various temples, photography, interaction with young Buddhist monks and the surrounding community, and a hike up to Thujidra if time permits. 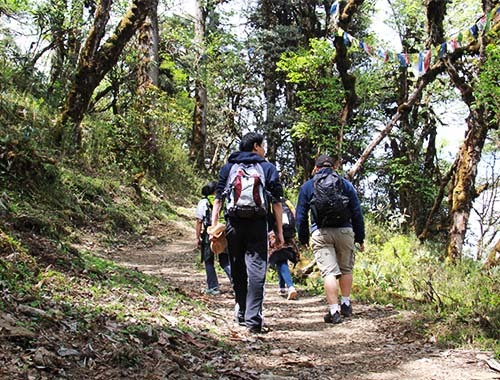 A picnic lunch will be served at a scenic spot followed by photography activities and a hike back to Thimphu following the trail to Motithang Takin Preserve. In the evening, explore the main town of Thimphu at your leisure. 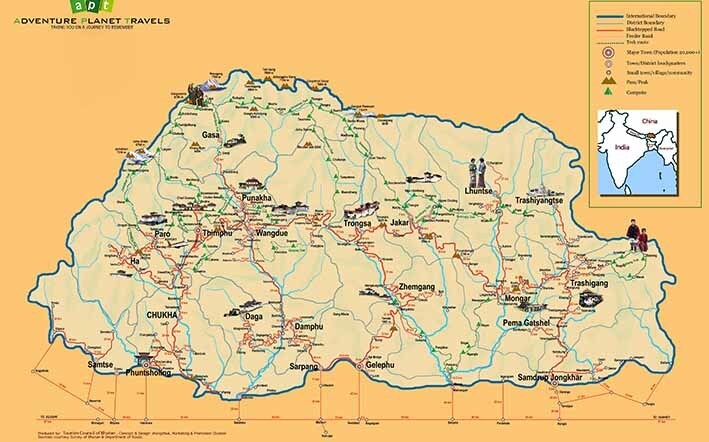 Drive up to Dochula Pass along the winding road passing through mixed alpine forest and interlocking valleys. There will be a brief stopover at a viewpoint above Simtokha to capture the sight of the first Dzong of Bhutan perched on gentle hill at the end of Thimphu Valley. Popularly known as Simtokha Dzong, it was built in 1629 by the eminent Tibetan Buddhist legend, Zhabdrung Ngawang Namgyal to institute the monastic school and administration centre of the valley. 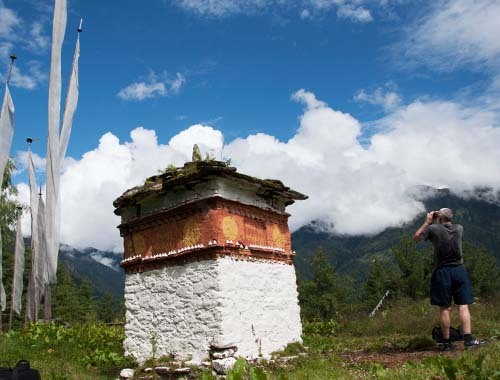 On arrival at Dochula Pass, spend around 20 minutes walking around 108 stupas, taking pictures of snow-capped mountains and hanging mountain prayer flags to summon good fortune. The hike begins from the trail leading through thick-forested raising hill on the right hand side of 108 stupas (Thimphu to Punakha direction). 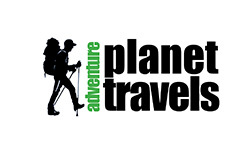 It is an easy to medium trek that will last for two and half hours, up and down walking through prominent trails. 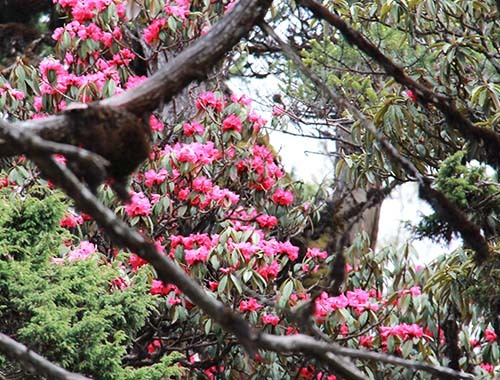 The hiking trail also constitutes birding sites and the famous magnolia flower photography spot in the early spring. On completion, lunch will be served at Dochula cafeteria in the close proximity of Druk Wangyal Chhorten. 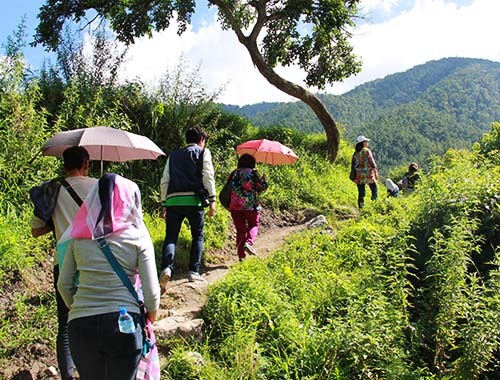 After lunch, enjoy an hour-long downhill excursion through winding road across Lamperi, Menchuna and Thinleygang capturing the breathtaking scenes of terraced rice field and villages settled on thick-forested hilly landscapes. Agriculture characterizes the main economy of the valley with production of one of the finest rice and agricultural products in the country. In the lower valley of Punakha, venture a short hike to Chhimi Lhakhang across typical rural village through terraced paddy fieds. The temple beautifully located on a gentle hill unfolds the history of a 13th century Buddhist legend, Lama Druk Kinley, existed to have known of his unique Buddhism teaching. He loved women and wine and used the power of jokes, songs and tales to preach Buddhism in the simplest manner to the common people. He had travelled all over the western region and left plenty of legacies. In the evening, receive a warm welcome by your local farmhouse/homestay family in the village. 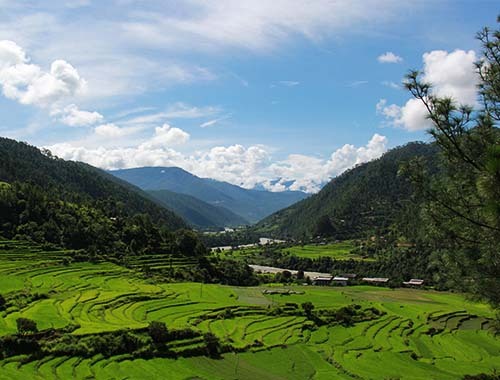 Today you will walk through one of the most beautiful valleys in the north of Punakha, across rural communities and visiting temples dating back to antiquity. After breakfast, drive north of Puankha for about 30 minutes to hike to Khamsum Yuelay Namgyal Chhorten at Yibesa Village. From the starting point, cross the suspension bridge spreading over Mochu River and follow the trail leading through green terraced paddy fields. The hike continues for 30-40 minutes and enjoys breathtaking rural sights and views of a meandering river through the valleys beneath. Khamsum Yuelay Namgyal Chhorten is famed for its strategic location, offering panoramic views of the surrounding valley from its rooftop. Spiritually, this richly crafted four storied stupa houses the statues of Dharma protectors and mesmerizing wall paintings in the first three floors that reveals Buddhist significance. 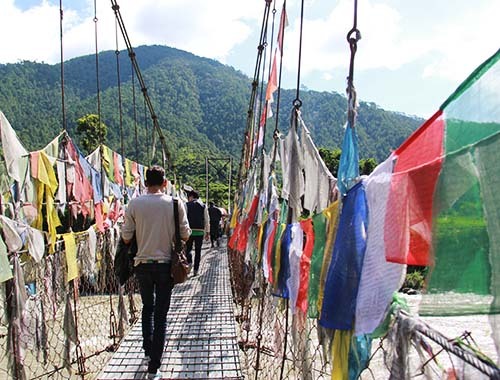 Upon completion, drive further up north for 15 minutes until you encounter Shoshi Zampa Bridge, the starting point of the hike to Chorten Nyingpo that will last for two hours. From the bridge, begin a gentle climb through mix forest and after crossing the newly built Uma Resort, you will head to Yuesukha Village, home to Drub Gang Temple personally visited by Zhabdrung in 1616. It was from this village that Zhabdrung trekked to Thimphu Chari Monastery and was later known to have conducted a magical spell for a week at Drub Gang Temple to inflict a Lama to death, for his rebellious act aimed at Zhabdrung. Bypassing the temple, you will encounter an old stupa that was designed after the Drub Gang Temple of Yuesakha, retaining the Zhabdrung’s hair as the main relic. It is orated by local folks that this stupa served as Chhokhor of Paazap, the regiment of Zhabdrung. Prior to the commencement of Punakha Tshechu (religious festival), the Paazap circumnavigate it as a symbol of respect to Zhabdrung and proceed to Punakha Dzong for the festival inauguration. From this stupa, an hour climb will reach you to your final destination, Chorten Nyngpo. Chorten Ningpo was founded in the 13th century by a famous Tibetan Saint, Lama Drukpa Kinley where he subdued demons at the present site of a temple while coming from Seu Laga. The Lama planted an oak tree as a sign of promise made by the demons to never hinder the spread of Buddhism. So after consecration of the site by Drukpa Kinley, Zhabdrung constructed the temple much after the dismissal of Lama Kinley. The temple later became the winter resident of Desi Tenzin Rabgay, the great grandson of Lama Kinley. 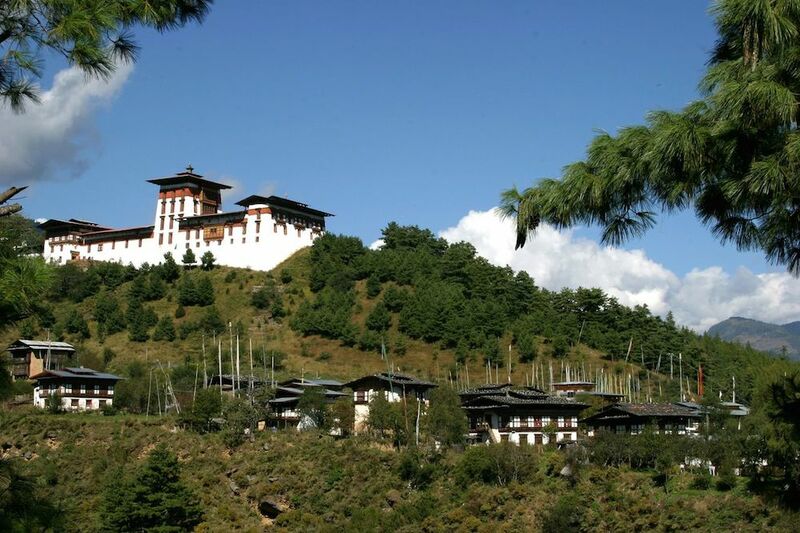 A picnic lunch will be served at Chorten Ningpo followed by an excursion to Paro. Geographically, Tiger’s Nest is located on a precarious cliff at 3120 meters, about 900 meters above Paro Valley. It was blessed by an eminent Indian Buddhist master, Guru Padmasamvawa, who conducted a three-month meditation in a cave to subdue the evil spirits in the 8th century. Following the visit of Guru Rinpochhe, several Tibetan Buddhist saints spent meditating in the cave and preaching Buddhism in the valley and across the country. Later in 1692, Desi Tenzin Rabgay initiated the construction of a temple at the Tiger’s Nest to introduce Mahayana Buddhism learning centre. The temple gradually turned into a place of worship by hundreds of thousand devotees from across the country and around the world. This approximately three-hour hike to Tiger’s Nest will offer unparalleled Himalayan adventure experiences intertwined with a blend of cultural and spiritual vibe. Adding to it, the scenic landscape and lush greenery will instil unforgettable memories that you will take back home. Enjoy a pleasant evening experience in a traditional hot stone bath in the farmhouse, believed to cure body aches, arthritis and sinuses, followed by a traditional dinner and cultural program by the locals. In the morning, your local guide will see you off at Paro International Airport to embark your flight for onward voyage.